PT Telkom Indonesia (Persero) Tbk - Telkom Indonesia (IDX:TLKM, NYSE:TLK) or known as "Telkom Group" is a state-run telecommunication and network services company in Indonesia, based in Bandung West Java. Telkom Indonesia has its business activities focused in six business portfolios; Mobile, Fixed, Wholesale & International, Network Infrastructure, Enterprise Digital and Consumer Digital. Telkom Indonesia offers a full range services in information, communications technology and telecommunications network. Its business include fixed wire line connections, fixed wireless connections, mobile communications services, networking and interconnection services and Internet and data communication services. Telkom Indonesia also engaged in providing various information, media and edutainment services, including managed services based on cloud and server, e-Commerce, e-Payment services and IT enabler, and other portal services. 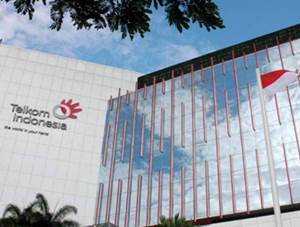 Telkom Indonesia is majority owned by the Government of Indonesia. As of December 2017, the Government of Indonesia holds 52.09% shares in Telkom Indonesia. Other 47.91% remaining shares was owned by Public. Telkom Indonesia's head office is registered at Graha Merah Putih Jl Japati No 1 Bandung. Telkom Indonesia now has 7 regional division offices and these regions gave Telkom Group a total of 60 telecommunication areas and 535 Plasa Telkom Outlets spread across Indonesia. Telkom Indonesia also supported by 11 directly-owned subsidiary companies; PT Telekomunikasi Selular (Telkomsel), PT Telkom Akses, PT Graha Sarana Duta, PT Patra Telekomunikasi Indonesia (Patrakom), PT Multimedia Nusatara (Telkom Metra), PT Dayamitra Telekomunikasi (Mitratel), PT Jalin Pembayaran Nusanatara (Jalin), PT Telekomunikasi Indonesia International (Telin), PT Metranet (Metranet), PT Infrastruktur Telekomunikasi Indonesia (Telkom Infra), PT PINS Indonesia (PINS). According to information found in PT Telkom Indonesia (Persero) Tbk Annual Report 2017 as quoted by JobsCDC.com, Telkom Indonesia’s performance in 2017 improved over the previous year. Referring to its annual report, Telkom Indonesia managed to record total revenue of Rp128,256 billion in 2017. This number is up 10.24% year-on-year (YOY) from Rp116,333 billion in 2016. Telkom Indonesia's total profit in 2017 experienced growth of 12.09% YOY tp Rp32,701 billion from Rp29,172 billion in 2016 in previous year. Required experience in advanced technologies as an architect / lead for minimum 4 years. Strong passion in technology, programming & software development. Firm grasp of algorithms, algorithmic complexities, design patterns and principles, clean code, and pragmatic aspects of programming. Very good analytical and logical thinking. Firm grasp in object-oriented, functional, or event-driven programming practices. Good experience in designing solutions for high performance, scalability, reliability, microservices, SaaS architecture. Very good experience in building large-scale web apps/services/APIs. Very good experience using cloud service such as AWS, Azure, etc. Advanced knowledge of information technologies (Database, Business Intelligence, Infrastructure, Networks, Web & Integration software). Good experience in mobile development. Technical experience in using Docker & CI/CD deployment. Advanced knowledge and experience in NodeJS, Golang, or Python. Very good knowledge of SQL / NoSQL. Required experience as scrum master for minimum of 2 years. Strong passion in technology and software development. Humble culture, zero egos, and excellent collaborative spirit. We are all here to learn together and grow together as a team. Eagerness to learn, eagerness to help, eagerness to share. Strong sense of analytical and logical thinking. Expert level facilitation and communication skills: ability to facilitate teams through tough conversations and maintain a positive and supportive team environment. Able to respond quickly, flexibly and positively to change, using it as an opportunity to learn, develop, practice and support the organization. Capable of defining problems, collecting data, establishing fact, drawing conclusions and recommending solutions. Technical experience as QA or software developer. Must be self-motivated as well as creative and efficient in proposing solutions to complex, time-critical problems. JobsCDC.com now available on android device. Download now on Google Play here. Please be aware of recruitment fraud. The entire stage of this selection process is free of charge. Telkom Indonesia - Software Architect,Scrum Master Telkom Group September 2018 will never ask for fees or upfront payments for any purposes during the recruitment process such as transportation and accommodation.